Botany is a course of study that's gone noticeably unrecognized in cinema. So while the world waits for a Carl Linnaeus biopic, we'll have to make do with perhaps the greatest Hollywood plant movie ever made: 1972's Silent Running directed by Douglas Trumbull—one of the pioneering figures of special effects in cinema and the key mind behind the technological innovations of films like 2001: A Space Odyssey, Blade Runner, and most recently, The Tree of Life—and cowritten by Michael Cimino (The Deer Hunter, Heaven's Gate). Silent Running, appropriately set in the year 2001, tells the story of a dedicated botanist (Bruce Dern) who tends to the last known plant life in existence aboard the Valley Forge, a large spaceship orbiting Saturn. When he's ordered to jettison his gardens, which are housed in massive geodesic domes, and return to Earth, he cuts all communication to his superiors, kills the four crew members keen on carrying out the orders, and enlists the help of three robots dubbed Huey, Louie, and Dewey to help him continue his research. This environmentally minded film stresses the importance of ecological harmony, but it's also one of the great pieces of speculative fiction in the 20th century. In his original capsule review for the Reader, Dave Kehr said, "the film is enjoyable for its intimacy, seriousness, and intelligent character work." For a film that mostly centers on one guy and three robots, there is a surprising amount of nuance in the characterization, and thanks to the enclosed setting of the ship there's a palpable sense of intimacy—but I'm not sure what Kehr means when he praises the film's "seriousness." In my estimation, Silent Running is self-serious—Dern's bleeding-heart enthusiasm for his work is so sternly depicted that it quickly becomes comical—but, like all great speculative fiction, there's a satirical edge to the narrative. In spurts, Silent Running outright mocks its main character: desperate for kinship after murdering his crewmates, Dern humanizes his robot compatriots by programming them to play poker, a sardonically scripted scenario not unlike something out of a Harlan Ellison story. An even bigger jab is thrown Dern's way when Dewey refuses to leave Louie's side after Louie is damaged in an accident. The compassion Dewey shows toward his fellow man—or in this case, robot—opposes the lack of compassion Dern showed for his own fellow man. 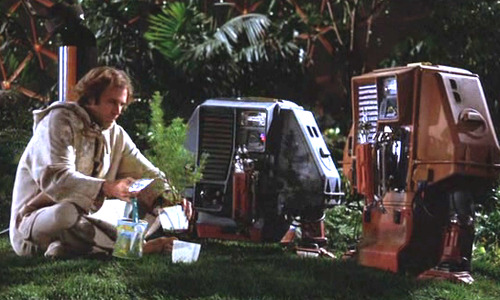 Ultimately, Silent Running might have more to say about the ways technology limits humanism than it does about botany, but plant life remains key to understanding the film. Dern's sprawling garden, framed by the emptiness of space and the cold industrialism of the ship, is the perfect aesthetic backdrop. It drives home the point that mankind is a product of nature, and that nature must be preserved in the face of man-made destruction. The film's final scene, which I won't detail here in order to avoid those pesky spoilers, is one of my personal favorites in all of sci-fi cinema, one that is tastefully evoked in the Pixar film Wall-E, another story about the necessity of nature for the success of humanity.